Produce and share information quickly. Print black-and-white images with 1200 x 1200 dpi resolution at up to 62 pages per minute (ppm). Scan full-color or black-and-white originals and distribute them via the Automatic Reversing Document Feeder (ARDF) and your choice of scan-to capabilities. Add optional paperless faxing to simplify how you distribute contracts and other forms. You can even add RICOH Streamline NX, Device Manager NX and other software to create automated workflows. Don't delay — choose the MP 601SPF to minimize workflow interruptions. Its high-yield components are designed for virtually maintenance-free operation for up to 500,000 prints. Add up to four adjustable paper sources to expand paper capacity to up to 2,600 sheets for fewer reloads. Use the MP 601SPF as your primary information hub in shared use environments. Whether you place it in the corner or on a cabinet, this powerful MFP can improve workflows and support PC, Mac® and host printing applications reliably and economically. Move between tasks and jobs with the same familiar touchscreen movements you use on your smartphone or tablet. Workstyle Innovation Technology lets you customize the digital user interface with the information you need to finish tasks faster. Simply navigate the intuitive, grid-like touchscreen to quickly produce or share information. Keep information flowing, no matter where work takes you. 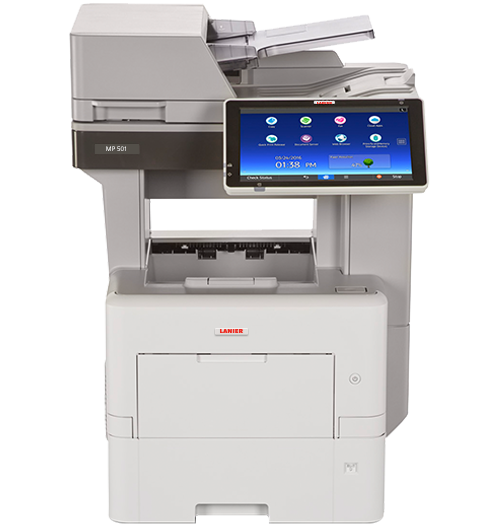 Use your smartphone or tablet to print remotely to the MP 601SPF when you download the RICOH Smart Device Connector app and RICOH App for Google Cloud Print. Find and access the documents you're looking for in your personal mobile device or favorite cloud application. Or, you can grab it online from the MFP's embedded web browser.